When the boys of Year 5 stood and placed their hands on the shoulders of their grandparents to sing a blessing upon them, there was barely a dry eye in the chapel. Never in recent memory has the St Patrick’s College chapel been so full for the celebration of Grandparents’ Day. After Mass, the boys escorted their esteemed elders to the College Hall before serving them a sumptuous morning tea, generously provided by the Year 5 families. It was a beautiful opportunity to show respect and hospitality to the elders of their family. 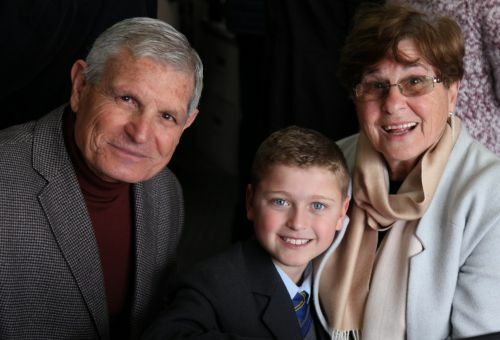 Finally, the boys welcomed their grandparents into their classrooms to share stories of the old days with their classmates – especially popular were the stories from Old Boys about how life at the College was in the old days. Grandparents’ Day is an important fixture in Book Week – a reminder that our written story-telling tradition is rooted in the oral tradition of our families.